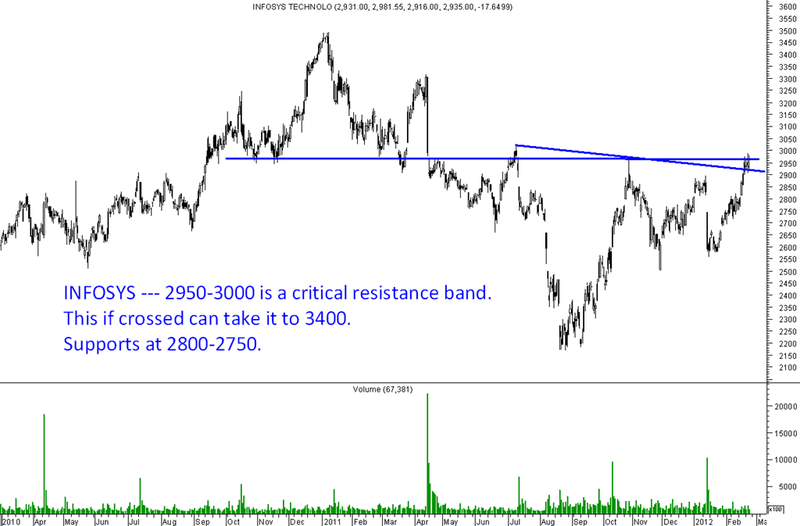 Infosys – A huge Pattern breakout is possible. -> The stock saw a huge sell off in 2011 results at 3400 levels. -> Ever since that the stock took a huge correction for many months. -> 2950-3000 has been a resistance for the last 6-8 months. The stock is now consolidating at higher levels and one may now watch for a breakout above 3000. -> Supports at 2800-2750 and one needs to watch for a good closing above 3000 which can happen in next few weeks to initiated a trade. We will get back to u. Is this an ainverted H&S(april onwards) or an Ascending triangle (sep onwards)? Important point is when it crosses 3000.